Sat 1 Nov, 6.30 – 9.00 pm. Fifteen years after ‘Bangkok in Black & White’ (1999), Manit Sriwanichpoom’s first book of images of his home town that reflect culture clash between old and new, comes ‘Bangkok in Technicolor’, his full-colour photo book. The morphing of Bangkok is now nearly complete; the result a strange mutation, a new environment garish and alien. Loomed over by the monstrous purple hybrid angel/Christmas tree and the fantasy landscape of giant billboards, riveted to a screen in their palms, the people in this space and time surrender themselves, and their city, to the homogenous consumerist dream of imagined worldly joys. Photographically, these arresting images bring a counter-intuitive revelation: our basic assumption about colour vs monochrome is turned on its head. For 21st Century man, black and white is no gritty realism but nostalgia and romance, especially if it’s noir. Fantasy has saturated the fibre of our being, taken over our perception, become our reality. Larger than life as if lived on a movie screen, our noir is now in vivid colour. 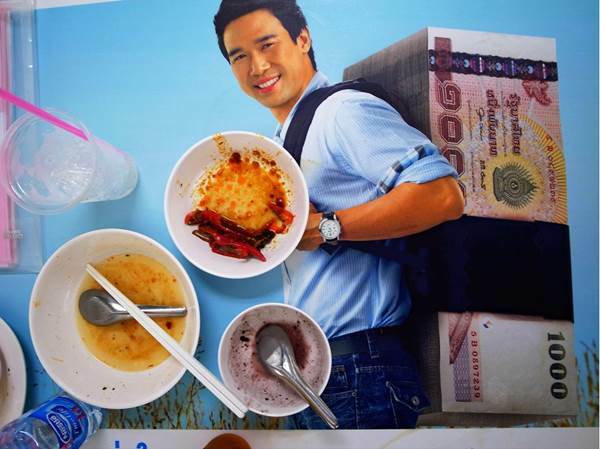 Thai contemporary photo-artist Manit Sriwanichpoom’s vibrant work offers a sharp and satirical view on Thai society, politics and religion. He has exhibited widely in numerous important international venues and art festivals. His work is collected by international museums, including the Maison Europeene de la Photographie (France), Deutsche Bank (Germany), Queensland Art Gallery (Australia), Fukuoka Asian Art Museum (Japan), and the Singapore Art Museum. In 2007 he was awarded the Higashikawa Overseas Photographer Prize. 87 Pan road (near Indian Temple), off Silom road, Bangrak, Bangkok 10500 THAILAND.